Aaron was born in the early 1800s. The 1850, 1860, and 1870 census records indicate he was born around 1801, 1802, or 1803. The 1850 and 1860 Sumter County, Georgia, census records note that he was born in North Carolina  [ 2]. The 1870 census says South Carolina . Aaron married Elizabeth Bashaba Cook, in Elbert County, Georgia, on March 21, 1819 . She may be the daughter of Nathaniel Cook of Elbert County; at least that's what the family trees say that I've found. I haven't yet found any records that attest to this. (I'll write about Elizabeth in a separate post.) Aaron and Elizabeth's first child was my second great grandfather William Jackson Brown. So far, I don't know who Aaron's parents were or where he came from in North Carolina (or South Carolina). How did he end up in Elbert County? He seems to just suddenly appear. 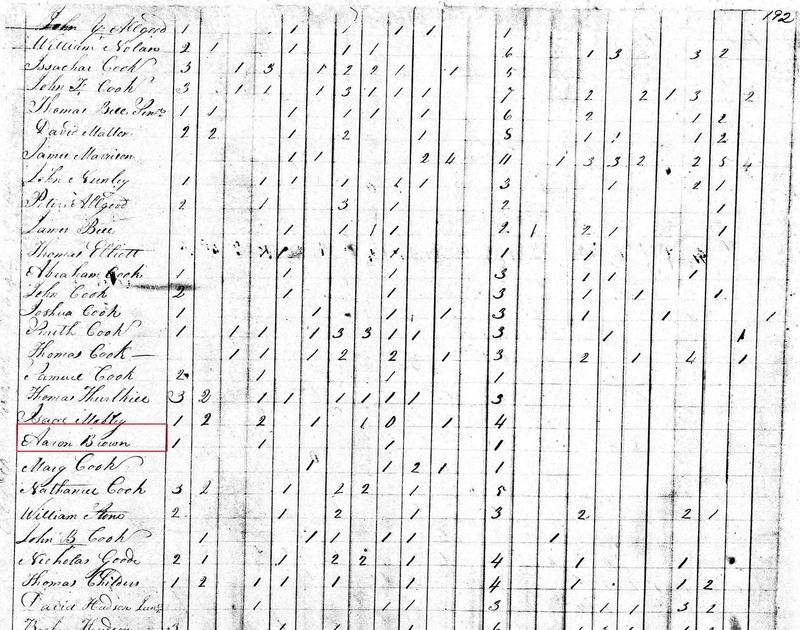 Aaron is listed in the 1820 Elbert County census, and his possible father-in-law Nathaniel Cook is listed 1 row down (there's a Mary Cook between them; see image below) . 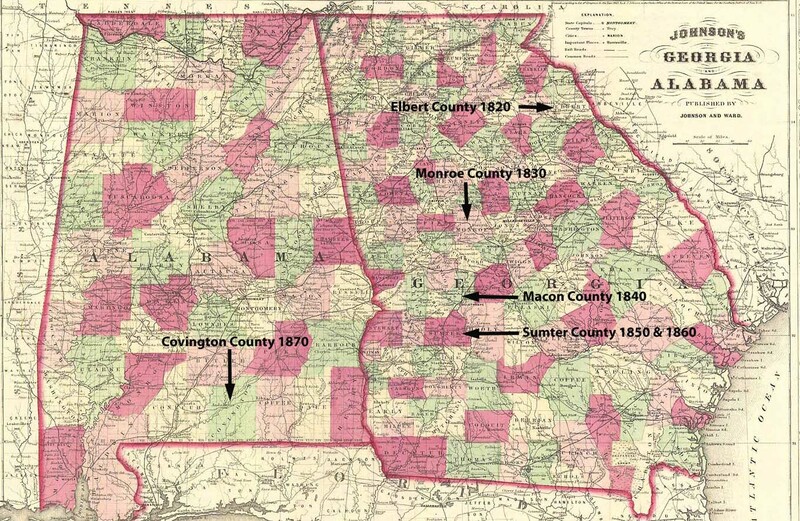 In 1827, Aaron is still in Elbert County. He drew land that year in the 1827 Georgia land lottery. The land was located in Bells District in Troup County; his residence is listed as Elbert County . 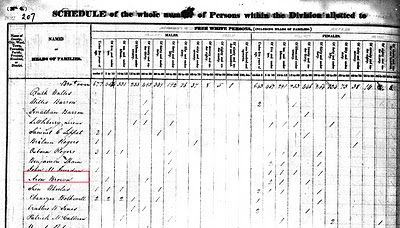 By the 1830 census, I believe that he has moved with his family to Monroe County, Georgia; his name is spelled "Aron" in this census (see image below) . (For folks that don't know, only the heads of household were listed in the U. S. census until the 1850 census, and the number of males and females were noted in age ranges. 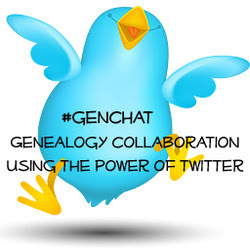 Beginning with the 1850 census, all members of a household were listed separately by name, age, etc.) Aaron's possible father-in-law Nathaniel Cook has moved to Monroe County as well . The Brown and Cook families may have moved to Monroe County together, or it could just be a coincidence that there is an "Aron" Brown in the same county as Nathaniel Cook. The age ranges of the children for "Aron" Brown in the census don't exactly match the ages of the children born before 1830 and still living at the time, but they're close (see the list of children below). A portion of the 1830 Monroe County Georgia census showing "Aron Brown" marked in red (from ancestry.com). Nathaniel Cook is listed three pages earlier (on page 204) of this census. By 1840, it appears that Aaron and his family have moved to Macon County, Georgia . The age ranges of the children in this census are a closer match to the ages of the children born before 1840 and still living at the time of the census (see list of children below). 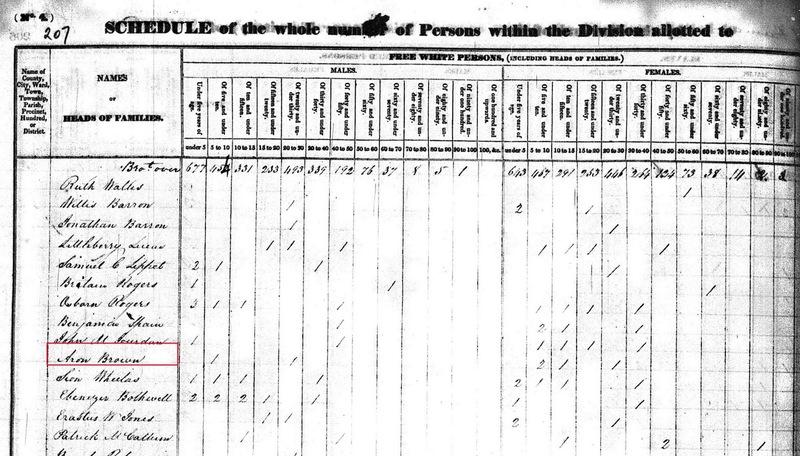 Interestingly, if this is "our" Aaron, he is listed as "Aron" Brown, Jr., in this census (see image below). 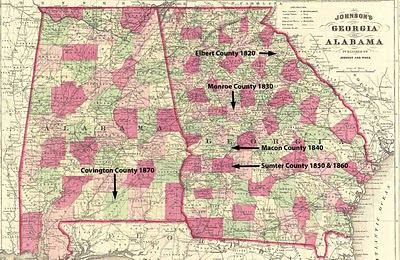 As I noted above, in the 1850 and 1860 census records, the Browns are in Sumter County, Georgia . (Their oldest child William has married by this time and is listed as a separate household in Sumter County in 1850.) 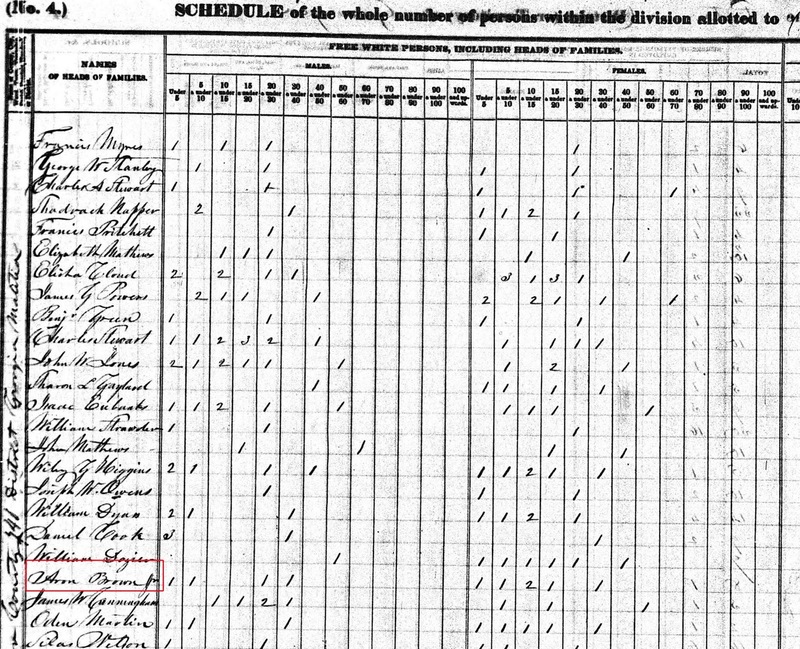 In 1850, Aaron's occupation is listed as "farmer." In 1860, he is listed as a "farm laborer," with real estate valued at $1,000 and personal property of $263. The Browns (including son William and his family) have moved to Covington County, Alabama, by the 1870 census . Aaron's occupation is listed a "miller," and the only property value listed is personal property of $150. Quite a change in property value from the 1860 census. Aaron died in Covington County, Alabama, on September 15, 1872. Here are the 15 children of Aaron and Elizabeth Brown. I have not been able to verify all of the dates below thus far. Below is an 1863 map that I've labeled (and cropped some) to show the migration of the Browns through Georgia and over to Alabama. I think I'll stop here before this post gets too much longer! In Aaron Brown, Part 2, I'll go over some more of the research that I've done. Ancestry.com. 1820 U S Census: Capt Olivers District, Elbert, Georgia, Page: 192; NARA Roll: M33_8; Image: 137. Martha Lou Houston. Reprint of the Official Register of the Land Lottery of Georgia 1827. Easeley, South Carolina: Southern Historical Press, 1986. Ancestry.com. 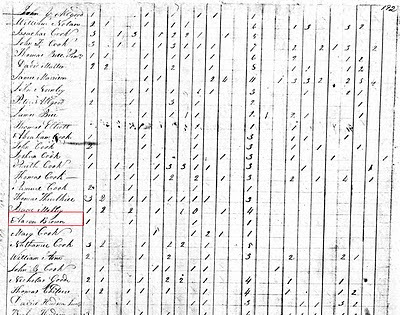 1830 U S Census: Monroe, Georgia, Page: 207; NARA Roll: M19-19; Family History Film: 0007039. Ancestry.com. 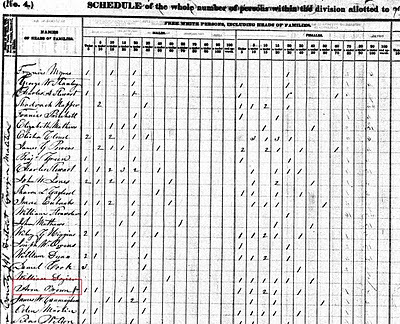 1830 U S Census: Monroe, Georgia, Page: 204; NARA Roll: M19-19; Family History Film: 0007039. Ancestry.com. Year: 1840; Census Place: Macon, Georgia; Roll: 46; Page: 15; Image: 613; Family History Library Film: 0007045. See footnotes 1 and 2 above. Hi, my name is Jonathan Lee, I believe we may be related. My 3rd great-grandfather is Alexander Taylor Brown. I didn't have any info on his parents so I searched on Ancestry.com and saw that many other members were searching about him. In the search results, people have listed Aaron Brown and Elizabeth Bashaba Cook as his parents. So I typed into google, "Elizabeth Bashaba Cook" and found your blog about Aaron and Elizabeth Brown. So, here I am, writing this comment on your blog. I love it when cousins find me through my blog, so thank you for writing a comment and letting me know that you stopped by. You're welcome! I know how that feels. I usually get contacted through Ancestry from cousin's I have never met who are doing their own research on our ancestors. It's always a cool feeling to be contacted by someone in your family that you never met. I'll click the "contact me" link and give you my email so we can trade info on our ancestors.